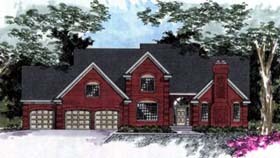 What a spectacular sight the brick and stucco finish of this home create, joined by a gorgeous gabled roof and decorative arches along the front of the home. Inside, enjoy the fireplace found in the private library or the expansive Great room. Meals are a snap in the modern kitchen which contains a center island, breakfast nook, snack bar and built-in desk. The trayed ceiling of the master suite creates wonderful ambiance and adds to its luxurious features.